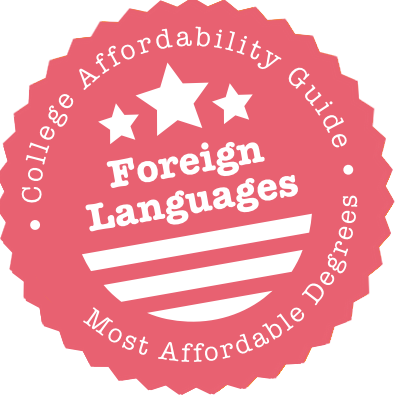 Scroll down to see the most affordable foreign language degrees, as well as info on the different types of foreign language degrees and foreign language program accreditation. The Department of East Asian Languages and Literatures offers Bachelor of Arts (BA) degrees in Chinese, Japanese, Korean, and in East Asian cultures. Master of Arts (MA) and Doctor of Philosophy (PhD) degrees in East Asian languages and literatures are available. Students in these programs can choose to concentrate on Chinese, Japanese, or East Asian cultural studies. Two other departments (European Languages & Studies and Spanish & Portuguese) offer BA, MA and PhD programs in French, German and Spanish. Beginning and advanced language programs as well as minors are available in Russian, Portuguese, and Italian. The Department of East Asian Languages and Literatures offers the following scholarships: the Ching-Suei Su Scholarship ($2,500) and the Jao Award in Asian Studies ($1,000). Throughout the year, foreign language students at the University of Minnesota-Duluth gather off-campus for relaxing evening discussions with faculty members in their selected language. The school offers Bachelor of Arts degrees in German, French and Spanish language and literature. Study abroad is encouraged, with students able to enroll at UM-Duluth tuition free while attending study abroad courses and summer programs organized by the school. Departmental scholarships primarily support international study, with the Conant ($1,000), Marinelli ($1,500), Knobloch ($1,500) and Kovacovic ($1,000) programs available. The Berkins Scholarship ($1,500) supports academic study. A minor in Deaf Studies, with proficiency in American Sign Language, is offered through the Department of Education though students from all programs are welcome to enroll. Students can focus on Classics and Classical Languages or Modern Languages at Texas A&M University-College Station through the Department of International Studies. All programs offer an interdisciplinary curriculum, with an emphasis on literature, language and culture. The school offers a Bachelor of Arts in Modern Language with emphasis in French, German, Russian, or Classics and Classical Languages. The Department of Hispanic Studies offers intense study of Spanish, leading to a Bachelor of Arts degree. International study in six countries is available, with summer, semester or year-long programs for academic credit. Campus connections with extracurricular and community engagement programs also help foster language proficiency and cultural understanding. Students are encouraged to choose a minor in a related field or seek teaching certification. The Department of Global Studies at the University of North Carolina-Chapel Hill encourages students to develop a full understanding of the complex issues through a focus on language, economics, politics, and culture. Bachelor's of Foreign Language areas include African, Asian, Latin American, Middle Eastern, Russian and Eastern Europe and Western European areas. Bachelor's degrees are also offered in Romance Languages and Classics and Classical Languages. Advanced study is offered at the MA and Ph.D. level in Slavic, Baltic and Albanian; Romance Languages; Classics and Classical Languages; and a Ph.D. in German. BA, MA and Ph.D. degrees in Comparative Literature and Linguistics are also offered. Study abroad programs are encouraged, with internships also available. The Division of Humanities at UCLA gives students the opportunity to study and learn up to 60 languages each year. Bachelor of Arts degrees are available in the following languages: Chinese, Japanese, Korean, French, German, Italian, Arabic, Spanish, and Portuguese. Master of Arts and Doctor of Philosophy degrees are available in French, German, and Italian. Spanish and Portuguese are offered up to the master's level only. Non-degree language classes are available in several different languages including Hindi-Urdu, Hebrew, Polish, Russian, Dutch/Flemish, Catalan, and others. Graduate students interested in studying the Japanese language by taking part in a language intensive program (in Japan or in the U.S.) can apply for the Sasakawa Japanese Language Study Fellowship (up to $10,000 per year). Take your pick of foreign language majors at UIC. There are Bachelor of Arts degrees in French and Francophone Studies, Germanic Studies, Spanish, Russian and Polish, not to mention corresponding Master of Arts and PhDs for most. Thanks to the Hejna Fund in Polish Language and Literature (earmarked for research and international exchange) and the Lithuanian Tuition Award (a tuition waiver for all courses in the language), the Department of Slavic and Baltic Languages and Literatures may be the best funded. Not to be outdone, the Department of Germanic Studies provides student research grants up to $5,000 for both undergrads and graduate students through the Jacobson "Bridges" Fund. Undergraduates interested in foreign languages can major in Spanish at Baruch College or they can devise an Arts and Sciences Ad Hoc Major, which allows the student to create a program of study in an area of interest. A student could devise an ad hoc major program that includes courses in French, Spanish or Italian; the ad hoc major must have at least 30 credits in relevant classes. Students seeking the bachelor's degree in Spanish must complete at least 24 credits, including classes in language and linguistics, Latin American literature, peninsular literature, and culture and civilization. The Department of Modern Languages and Comparative Literature offers minors in Chinese, French, Hebrew, Italian, Japanese, Spanish, Spanish-English translation, and comparative literature. Owing to Vassar's strong international focus, there are four foreign languages available as undergraduate majors: Chinese, French (paired with Francophone Studies), Italian and Japanese. However, the actual list expands slightly thanks to related degrees in German Studies, Hispanic Studies, Jewish Studies and Russian Studies - all of which include language requirements. For students in these programs, study abroad is all but assumed, and summer study is particularly popular. Some departments help with financing. The French Department, for instance, gives out three scholarships for study in French-speaking countries. Back on campus, the Hispanic Studies Department delivers the Antonio Marquez Prize to student writers, translators and filmmakers. Incoming students will find an abundance of foreign language minors - from Arabic to Russian - at UC Riverside, plus a BA in Spanish. That program encourages students to earn a double major, which opens up funding opportunities from other departments. Anyone pursuing an MA or PhD in Spanish receives consideration for a teaching assistantship, which would cover the cost of their tuition and garner a stipend. It's best to apply directly to the PhD program (as opposed to the MA), as doctoral students get priority for financial assistance. The school casually forecasts five years of funding via a teaching position for such students. The Literature Department at UC San Diego offers Bachelor of Arts degrees in French, German, Italian, Russian, and Spanish literature. Beginning language courses are available in Greek, Korean, Latin, and Russian. Intermediate and advanced classes are offered in French, German, Italian, and Spanish. Minors are available in all the languages above except Korean, and with the addition of Hebrew. All literature majors are required to study a secondary literature that is taught and written in a language different from the language of their primary concentration. As part of the Division of Arts & Humanities, students studying foreign languages can apply for the Bebe and Marvin Zigman Scholarship, which gives a one-time award of up to $2,000. Interdisciplinary study in a variety of languages allows students to integrate study of a foreign language, literature and culture at the University of Minnesota-Twin Cities. The school offers Bachelor's degrees in East Asia, Russian, German, Scandinavian, Germanic, French, Italian, Spanish, Hebrew, Classics and Classical Languages and Latin, with a certificate or minor in Language Interpretation and Translation. Master's and Ph.D. degrees are offered in East Asian languages, French and Romance languages, with Ph.D. degrees in Spanish and Classics and Classical Languages. Writing Centers, libraries and student organizations offer cultural and extracurricular activities, and international study is encouraged. Students can also choose to study world literature or how language is learned with a full range of degrees in Comparative Literature or Linguistics. The School of Arts and Sciences at Rutgers University offers undergraduate majors in Italian, Chinese, French, German, Russian, Spanish and Portuguese. Graduate degrees are also available in Spanish, French, Italian and Chinese, including Master of Arts, Master of Arts in Teaching and Doctor of Philosophy degrees. Most undergraduate language majors require 36 credits of major coursework. The undergraduate French major can be completed in three tracks of study: literature, culture and linguistics. Spanish majors have the option to complete a five year B.A./M.A. in Spanish with a concentration in translation. They can also take part in a five-year teacher education program through the Graduate School of Education. Students in all foreign language programs are encouraged to study abroad for academic credit. Students interested in a foreign language can earn a Bachelor of Arts in French or Spanish at Buffalo State. The French program has two tracks: Francophone Studies for students planning on graduate school, or Professional French for students who want to use French on the job. Undergraduates can also enter the French Education or Spanish Education programs, which prepare them to teach a foreign language in grades 7-12. Graduate programs offered by the Department of Modern and Classical Languages all focus on teaching. The Foreign Language Education master's prepares teachers with initial licensure for professional licensure and extends certification to grades 1-6. Buffalo State also has post-baccalaureate programs to prepare French or Spanish majors to seek teacher certification. SUNY Oswego students interested in foreign languages can major in French, German, or Spanish, or they can earn an interdisciplinary major in Language and International Trade. Students in the French and German programs have the option of following either a language and literature track or a culture studies track. Outside the classroom, students have many opportunities to practice the foreign language, including language clubs, foreign film festivals and a weekly international coffee hour hosted by the Modern Language Department. Oswego also offers a variety of study-abroad programs for students who want to immerse themselves in a language. Along with the three major languages, the department offers courses in Arabic, Chinese, Japanese, Portuguese, and American Sign Language. The University of California Berkeley is practically a United Nations of foreign language programs. In addition to the typical Romance languages (like French and Spanish) and German found in many colleges, Berkeley has departments dedicated to teaching East Asian, Scandinavian, and Slavic languages. The Department of Near Eastern Studies also has classes in languages such as Arabic, Hebrew, and Persian. Most of these departments offer a bachelor's degree and a Ph.D. program, and some also have a master's program. Graduate students may be eligible for fellowships and instructorships. Students in any major who take Chinese classes should look into Berkeley's Huang Program, which provides intensive language lessons in China one summer and an internship there the next summer. The College of Letters and Science at UC Davis offers language studies through the Department of Humanities, Arts, and Cultural Studies. Bachelor of Arts degrees are available in Chinese, Japanese, French, Italian, German, Spanish, and Portuguese. Master of Arts and Doctor of Philosophy programs are available for French, German, and Spanish. Language students are encouraged to take advantage of Study Abroad opportunities that support the language and culture of their major. Blakemore Freeman Fellowships and Refresher Grants for Advanced Study of Asian Languages supports qualified students in the Chinese and Japanese programs. The grant covers tuition and includes a stipend for transportation as well as living and educational expenses. Students studying the German language can apply for the Emilyn Louise Vaage Scholarship. The Language and Culture Studies Department at Westfield State hosts one linguistically focused major - a BA in Spanish - along with several minors with a more holistic focus, namely, French and Francophone Studies and Latin American and Caribbean Studies. The Spanish major, like most degrees at Westfield, incorporates an internship, providing students ample time to practice their skills with native speakers. The 40-50 students in the department are heavily involved in the International and Intercultural Club, the Multicultural Student Association and the Nation Association for Empowerment. Above-average Spanish students also qualify for membership in Sigma Delta Pi. Barnard College offers a wide range of majors for students who are interested in earning a bachelor's degree in a foreign language. Available majors include French Language and Literature, French Translation and Literature, French and Francophone Studies, German Language and Literature, German Studies, Italian, Russian Language and Literature, Russian Regional Studies, Slavic and East European Literature and Culture, Slavic and East European Regional Studies, Spanish and Latin American Culture, and Comparative Literature. Students may also minor in French, German, Russian, Italian or modern Greek. Programs such as German Studies combine language and literature classes with courses in history, political science and related social science courses. Barnard offers many study abroad programs appropriate for foreign language majors. The Department of Foreign Languages and Literatures at SUNY Oneonta grants bachelor's degrees in French and Spanish and has programs for students who want to teach one of those languages. Minors are offered in French, Spanish, and Arabic and Islamic studies. The department also offers classes in several other languages, ranging from American Sign Language to Italian, and has a self-instructional program that covers even more languages. For additional practice with the new language, students can take a study abroad trip or join the French, Spanish, or Italian Club. The campus also has a chapter of the Phi Sigma Iota foreign language honor society. The Department of Languages, Literature and Cultures at Appalachian State offers undergraduate degrees in French and Spanish as well as a BS degree in either language that prepares a student to teach the language for grades K-12. Students are required to take classes in the literature and culture of the language they are studying. Graduate students can earn a Masters in Romance Languages with a specialization of teaching French or Spanish. Grad students may also specialize in teaching K-12 or teaching college. The language department has a well-equipped language lab and offers classes and minors in several other languages, including Russian, Arabic, German and Japanese. Study abroad programs allow students to use the language among native speakers. An array of languages and literature studies are offered by the University of Massachusetts-Amherst, with Bachelor's and Master's degrees in Chinese, Japanese, French, Spanish and Classics and Classical Languages, and Bachelor's degrees in Italian and Portuguese. Students can also choose Bachelor's, Masters, and Ph.D. programs in Linguistics and Comparative Literature. The university's collaboration with the Five College Interchange offers additional course options in Arabic and access to the Study of World Languages program. Resources such as the Translation Center and Language Teaching and Research Lab provide opportunities to improve language skills in a business or academic setting, and residential programs offer an immersive experience. Study abroad opportunities are available in more than 50 countries, with scholarships offered to support international study and internships. St. Cloud State's language department supports a service learning component for foreign language majors. This program allows students to receive credit for participating in an organized service activity such as working in the Spanish-immersion program at a local elementary school or teaching English to foreign speakers at a local high school. St. Cloud offers a Bachelor of Arts in French, German or Spanish, or a Bachelor of Science in the same three languages for students who want to earn their teaching certification. The department also offers a BS in Teaching English to Speakers of Other Languages. Study abroad programs at St. Cloud include Germany, Chile, France and Japan, and the department has many scholarships for study abroad. The Language and Literature Department at Wayne State College offers a Bachelor of Arts in Spanish, as well as a Spanish teaching endorsement. Spanish majors complete coursework in elementary and intermediate Spanish, conversation and composition, Spanish civilization, Spanish literature and advanced grammar. Students who choose to earn the Spanish teaching endorsement are also required to earn an endorsement in a second subject. Additionally, Spanish majors can study abroad and participate in student organizations like the Spanish Club and the National Spanish Honor Society Sigma Delta Pi. The College of Liberal Arts at CSU Long Beach offers Bachelor of Arts and Master of Arts degrees in the following languages: French, German, Italian, and Spanish. Japanese and Chinese are only offered at the baccalaureate level. For students who plan to pursue careers as foreign language teachers after graduation, Single Subject Teaching Credential Programs are available in Japanese, German, French, Italian, and Spanish. The Department of Asian Languages offer courses in Cambodian, Korean, Tagalog, and Vietnamese. A minor in Russian is also offered. Study Abroad scholarships are available, such as the Kyera & Nicole Giannini Scholarship ($1,000) for Italian Studies majors, the Amy Kimball Memorial Scholarship (up to $600) for students majoring in German, and the Russian Program Scholarship ($1,000). The Department of Languages, Literatures and Cultures at SUNY University at Albany has degree programs leading to a Bachelor of Arts, Master of Arts, or Ph.D. in Spanish. The department also offers a minor in six different languages, including Russian, Hebrew, and Italian. Students can also study Arabic, German, or Latin. Beyond the classroom and the language lab, students can practice the new language with events such as German movie night or the Olympiada of Spoken Russian. You can also join a language club or sit at a language table. The language department grants several named scholarships and prizes, including the Frank Carino Memorial Scholarship for Spanish majors and the Guy Enfanto Memorial Award for a student of French. At Stony Brook University, undergrads can major in in French, German or Spanish Language and Literature or in Italian Studies. The Italian program at Stony Brook is considered one of the most comprehensive in the United States. Teacher preparation is possible with any of these languages at both the bachelor and master's degree levels. The Department of Hispanic Languages and Literature also offers a Ph.D. program. Students are encouraged to study abroad in a country where the language they are studying is spoken, and the university offers a range of travel programs, from short-term trips to exchange programs. Guest lectures, conferences, foreign film nights and other cultural events help students enrich their on-campus learning experience. Iowa State University offers a Bachelor in German, French and Spanish and minors in several other languages, including Russian. Each language program offers extracurricular activities to provide students an opportunity to practice speaking the language, and the Iowa State University Study Abroad Center offers a wide range of options for students to immerse themselves in the language and culture they are studying. For an even more in-depth visit to another country, students may be able to do an internship as part of their study abroad program. The Department of World Languages and Cultures offers a number of scholarships, including the Van Iten Study Abroad Scholarship ($500), the Ronald A. Schubert Scholarship ($1,000) and the Louise Semmons Scholarship ($500-$1,000). The University of Florida's Department of Languages, Literatures and Cultures conducts research and instruction in more than 22 languages. Bachelor of Arts degrees are offered in East Asian, Russian and Portuguese Languages and Literature. BA and Master of Arts degrees are granted in German, French, Spanish, Latin, and Classics and Classical Languages. Doctorates in research of Romance Languages and Classics and Classical Languages are also offered. The Department of Linguistics offers Bachelor of Arts, Master of Arts and Ph.D. in Linguistics. Recognizing the value of an international experience, the department offers several study abroad programs. Scholarships, such as the Daniel Sinclair Bredahl ($3,000) and UF International Center ($4,000) Scholarships, support a full year of international study. Berea College offers Bachelor of Arts degrees in French, German and Spanish, as well as undergraduate minors in French, German, Spanish and Latin. Students in all three foreign language majors are required to complete at least seven courses in their chosen language, as well as a general course in the study of language. Foreign language majors are also strongly encouraged to study abroad in a country that speaks their chosen language. Foreign language majors can participate in clubs like the Cosmopolitan Club and the German Club, can sit at Foreign Language Tables in Dining Services to practice language skills and have access to the Language Lab for academic assistance. The Division of Modern Languages at Alfred University offers an undergraduate major in foreign language and culture studies with a concentration in French, as well as an undergraduate French minor. The major in foreign language and culture studies with a concentration in French requires the completion of 20 credits of upper-level French courses, at least eight credits in a second foreign language and 12 credits of electives. The French minor requires the completion of 20 credits, at least 16 of which must be taught in French. Modern languages students also have the opportunity to live in the language house with a native French speaker, participate in the French Club and study abroad in a French-speaking country. The State University of New York-Binghamton offers a host of possibilities for students who want to study a foreign language. Undergraduate degrees are available in German, French, Italian, Spanish, Arabic and Latin. Additionally, a Bachelors in Classical Languages allows a student to study the classics, Greek and Latin. Master's degrees are available in French, Italian and Spanish, and grad students can choose to earn their teaching certification for teaching French or Spanish. Many scholarships are available. The German Department offers the Keith Nintzel Award for Academic Excellence ($1,000) and the Weigand Study Abroad Scholarship ($1,500). Scholarships for Romance language students include the Sophie Kradjian Memorial Scholarship, the Louis Magnotta Scholarship for Italian Studies and the Rigo Mignani Memorial Scholarship. Michigan State allows undergraduates to major in Spanish, French, Arabic, Chinese, German, Japanese or Russian. More than a dozen other languages, from Portuguese to Zulu, are regularly taught, and still more languages are offered under special circumstances. Language clubs and study abroad opportunities enrich the experience foreign language majors have and help them increase fluency and comprehension. The university also offers graduate programs in linguistics, French studies, Hispanic Literature and Cultural Studies and German Studies. Available scholarships include the Endowed Scholarship for German Language and Culture in Mayen Program, the Thomas W. and Sarah L. Juntune Endowed Scholarship for Study Abroad in Freiburg, and the George F. Peters Scholarship. Foreign languages at Queens College are grouped into three different departments, allowing for a large number of degree programs. Bachelor degrees are available in Latin, Ancient Greek, Hebrew, Chinese, Spanish, French, German, Italian and Russian. The college also offers a Masters in Spanish, French or Italian, or students can get a master's degree in those languages with teacher certification. Clubs, honor societies and foreign films enrich the experience of foreign language students at Queens College. Foreign language majors may apply for scholarships such as the Italian Fellowship Endowment, the Norman H. Paul French Award Endowment and the Sheila Endler Landau Memorial Endowment. The Department of Modern Languages and Literatures at Cal State Fullerton offers Bachelor of Arts degrees in French, Japanese, and Spanish. Minors are available in Chinese, German, Portuguese, and Vietnamese. The department also offers concentrations in Chinese, French, German, Japanese, Portuguese and Spanish for students who are pursuing a Bachelor of Arts in International Business degree. At the current time, courses are offered in the following languages: Arabic, Italian, Korean, Latin, and Persian. On the graduate level, there is a Master of Arts in Spanish program available. Students have access to the Modern Language Media Center where they can explore language materials of the countries they are studying. Outstanding foreign languages students are nominated for the Roberta King Maxwell Scholarship ($300). The Department of English and Modern Languages at Northwest Missouri State University offers Bachelor of Arts, Bachelor of Science and Bachelor of Science in Education degrees in Spanish, as well as an undergraduate Spanish minor. Both the B.A. and the B.S. in Spanish require 37 credits of major coursework, including courses in beginning and advanced conversation and advanced Spanish composition. Students are also required to complete a study abroad experience or an approved internship. The B.S.Ed. program requires 34 credits of major coursework and certifies students to teach Spanish in K-12 classrooms. The B.S.Ed. curriculum also includes a study abroad experience or internship. In a city known for its cultural diversity, the City College of New York offers courses in 13 different foreign languages. Students can earn a Bachelor of Arts in French, Spanish, Italian, or Two Romance languages, and graduate students can earn a Master of Arts in Spanish. Other languages offered include Arabic, Chinese, classical Greek and Latin, Hebrew, Hindi, Japanese, and Portuguese. The Department of Classical and Modern Languages and Literatures sponsors several organizations, including chapters of the national French and Spanish honor societies, a French language and cultural center, and clubs for students interested in French, Italian, Spanish, and the classic languages. CCNY has many study-abroad programs, including internships in foreign countries, available to foreign-language majors. Students interested in majoring in a foreign language at Hunter College can choose from German, French, Italian, or Spanish. The Department of Romance Languages offers undergraduate majors in French, Italian, Spanish (with possible concentrations in Literature or Translation and Interpretation), Romance Languages (two languages), Teaching Adolescent Education, or Comparative Literature. The Department of Romance Languages also has a Master of Arts program. The German Department grants a bachelor's degree in German and helps prepare students to become German teachers. German students must take classes in German language, literature and culture. Hunter's foreign language departments offer exchange programs, foreign language clubs and honor societies, film festivals, and opportunities for students to study abroad. Brooklyn College offers an array of degrees for students interested in foreign language. Undergrads can earn a Bachelor of Arts in French, Italian, Russian, or Spanish, or earn a B.A. in language and business in any of those languages. Students can also earn a degree as a grade 7-12 teacher of Spanish, Italian, or French. German and Chinese are offered as a minor. Graduate students may earn a Master of Arts in French or Spanish, or they may earn an M.A. as a French or Spanish teacher, with coursework divided between the foreign language and courses in education. Departmental scholarships include the Paul J. & Angela H. Salvatore Scholarship, presented to an outstanding undergraduate studying a romance language. In-depth study of a foreign language not only allows for better communication, it also helps to develop understanding of different cultures and their rich artistic and literary histories. The State University of New York-Plattsburgh Department of Modern Languages offers the opportunity to earn a Bachelor of Arts degree in French or Spanish. The college's proximity to Montreal allows for many opportunities to engage in casual conversation using French language skills. The French Club is very active, organizing a film festival and regularly hosting special speakers and dinners. Study abroad programs are offered in France and Spain, as well as a number of other countries around the world. The University of North Texas offers a Bachelor of Arts in French, a Bachelor of Arts in Spanish, and a Bachelor of Arts in German. They also offer minors in Spanish, Russian, Japanese, Italian, German, French, Chinese, or Arabic. The Department of World Languages, Literatures, and Cultures also offers a Master of Arts in French, a Master of Arts in Spanish, and a graduate minor in French or Spanish. French, German, and Spanish students are eligible for the Martha & Voncile Liddell Scholarship as well as the Edist/Solveig Olsen Scholarship. French and German students are eligible for the Robert Hardin Scholarship. There are a number of other scholarships available to German, French, and/or Spanish students as well. The Department of Modern Languages at CSU Stanislaus offers a Bachelor of Arts in Spanish degree, a minor in Portuguese, and introductory studies in American Sign Language and in Italian. Spanish is also offered as a concentration in the Liberal Studies program. Students must complete 14 units of lower division Spanish prerequisites and 24 units of upper division Spanish major requirements, in addition to 51 units of general education requirements in order to graduate from the program. The curriculum includes courses in Spanish grammar and composition, the literature and civilization of Spain, and the literature and civilization of Spanish America. The program qualifies students for the California State Single Subject Credential, which allows them to teach Spanish at the secondary level. The Department of English and Foreign Languages (EFL) offers a Bachelor of Arts in Spanish that provides the subject matter competency required to pursue a single subject credential in Spanish for those who wish to teach the subject in middle or high school. The program also prepares students for further study or for careers in domestic or international settings that require a firm grasp of Spanish. The department offers minors in Spanish, Chinese, and French, as well as an EFL Certificate Program in German Studies. The certificate can be earned concurrently or after the completion of bachelor's degree. All incoming qualified freshmen are automatically considered for the Dean's Scholarship ($1,500), while the EFL Scholarship Account is for continuing EFL students (variable amount). Foreign language graduates end up in exciting places. You’ll find them interpreting in courts, translating novels, guiding planes, managing hotels, and negotiating major finance deals. They work as art dealers and event planners, university professors and investment analysts, CIA agents and diplomats. Language students may have to fight harder for jobs than peers with professional degrees, but with firm goals, strong grades, and a commitment to gaining work experience, they are invariably successful. If you’re thinking about studying a foreign language, check out our quick guide to affordable foreign language programs. We cover everything from degree options to career opportunities to the importance of regional accreditation and what kinds of qualifications are available for interpreters and translators. An associate’s degree in a foreign language (e.g. Chinese, Spanish, Russian, etc.) is a 2-year undergraduate program that gives students a foundation in language skills. This degree is often offered by a variety of community colleges and universities. A GED or high school diploma is required to apply. Many students use an associate’s degree as a stepping stone to a bachelor’s degree. If you are considering this option, make sure your associate course credits will be transferable to the BA program of your choice. Almost all foreign language degrees are offered as an Associate of Arts (AA). This interdisciplinary program is a mixture of general education requirements and liberal arts courses. If you are short on funds and time, you may wish to consider a certificate or an online course instead. These programs focus more on learning a language, and less on the literature and culture surrounding it. Career opportunities are fairly limited with an associate’s degree. Having said that, mastery of a foreign language is an excellent way to further your career. Flight staff, hotel employees, and event planners, for example, are frequently multilingual. You can increase your odds of employment by participating in internships and work-study programs. A bachelor’s degree in a foreign language is a 4-year undergraduate program that provides students with a fundamental grounding in the mechanics, literature, culture, and history of a language. A GED or high school diploma is required to apply. Bachelor of Arts (BA): The most common program for foreign language majors. This interdisciplinary degree is a mixture of general education requirements and liberal arts courses. Bachelor of Science (BS) or BA in Foreign Language Teacher Education: Targeted at students who are interested in teaching a foreign language to K-12 students and earning state licensure/certification. Remember that many schools will allow you to study two or more languages, pursue a double major, or use a foreign language as a minor. For example, to cut down on coursework in literature and culture, some students have opted to major in international relations and minor in a foreign language. This gives them the opportunity to combine language study with classes in business, political science, and economics. The first two years of a BA tend to be a mix of liberal arts/general education (e.g. English, math, science, etc.) and fundamental coursework in a foreign language (e.g. grammar, composition, conversation, reading skills, culture, and literature). Once schools are satisfied that you have a strong foundation, they’ll give you the chance to explore related electives such as translation, linguistics, business, religion, history, cinema, and more. Look for programs that offer a year abroad and opportunities to immerse yourself in real-world experiences. The best way to learn a language is to be surrounded by it. If you’re thinking about becoming a K-12 teacher in a public school, you will need to complete a certification program or a teacher education degree and earn a state teaching license. For more about this procedure, check out our article on K-12 Teaching. A master’s degree in a foreign language is a 1-3 year graduate program that allows students to focus on advanced study and research. Many students who pursue this degree are working professionals who wish to advance their careers or earn a PhD. Entrants are expected to have a bachelor’s degree in their chosen language. Master of Arts (MA) in a Foreign Language: Often earned by students interested in research, specific language-related disciplines (e.g. interpreting, translating, etc. ), and/or a PhD degree. Master of Arts (MA) in Teaching a Foreign Language: Typically aimed at teachers and administrators at the K-12, university, and community college level who wish to improve their job opportunities or become state licensed/certified. General foreign language concentrations include interpretation, translation, foreign literature, comparative literature, etc. A master’s degree can set you up for higher level positions in your field (e.g. education administration), prepare you for a PhD, or help you concentrate on area of particular interest in your career (e.g. interpretation, translation, etc.). But you don’t need to earn a master’s degree to learn a language. A quicker way to achieve this goal is to earn a certificate or take commercial courses such as Rosetta Stone. A doctorate in a foreign language is an advanced graduate degree that takes 3-7 years to complete. Since it is intended for aspiring university professors and high-level education administrators, it is heavily focused on research. Unless you find a combined master’s/PhD program, a master’s degree in a foreign language or a related field is required to apply. Doctor of Philosophy (PhD): A research-focused degree aimed at students who wish to become researchers or teach at the university-level. Doctor of Education (EdD): An education-focused degree designed for students who have earned a master’s degree in foreign language education or TESOL, literacy, social studies, or early childhood education. EdD candidates may focus on areas such as language acquisition, language in culture and identity, language assessment, and bilingualism in educational contexts. PhD candidates may be exploring areas such as literature, culture, and translation. During this time, candidates may also be required to pass translation or language exams. In the last few years, students have more freedom to focus on original research. This work must be written up in a book-long dissertation. As preparation for their future careers, doctoral students also often teach undergraduates during this time. PhD graduates tend to become academics and foreign language faculty at universities and colleges. EdD graduates take up leadership positions in K-12 schools (e.g. district curriculum supervisor) and become education professors at teaching-focused universities and colleges. A certificate in a foreign language is an academic, non-degree program that focuses on specific skill sets. It usually takes less than a year to complete. Certificates are widely available from universities and colleges. Thanks to demand, online offerings continue to grow in popularity. Undergraduate Certificate in a Foreign Language: Can be used to supplement or earn credits for an undergraduate degree. Graduate Certificate in a Foreign Language: Intended for working professionals who wish to gain skills for their career, improve their job opportunities and/or earn credits for a master’s degree. Is a Certificate Worth It? When it comes to language learning, you have lots of options. As well as a certificate, you could think about programs such as Rosetta Stone, Fluenz, or free online courses. Some professionals opt for a graduate certificate because they prefer the discipline of an academic program and feel that it carries more weight in the workplace. As a rule of thumb, we recommend that your college or university has regional accreditation. This is a “seal of approval” granted to institutions (e.g. non-profit and public colleges and universities) by one of six regional accrediting bodies (e.g. North Central Association of Colleges and Schools). Regional accreditation only applies to a college or university. There is no specific accreditation for foreign language programs or degrees. As a translator, you may wish to think about voluntary certification from the American Translators Association (ATA). To become certified, candidates must pass a three-hour exam designed to assess professional level translation skills in a specified source-target language combination. ATA certification isn’t necessary to become a translator. What’s more, some language combinations are unavailable. But certification may give you an extra edge over other job candidates. Many interpreters start their careers by visiting the website of the Interpreters Guild of America (IGA). This is an organization that advocates and supports independent interpreters. There is no certification process, but interpreters are invited to become members. Federal courts administer a Spanish-English Federal Court Interpreter Certification Examination for Spanish interpreters; state and municipal courts usually have individual forms of certification. Learn more about Language Access Programs by State. The National Association of Judiciary Interpreters and Translators (NAJIT) used to offer certification for court interpreting, but this was discontinued as certification became available through state courts. For each level, interpreters are expected to go through an application and telephone screening process, take part in an interview, and pass the Interpreting Aptitude Test. Simultaneous interpretation is tested from in a soundproof booth with sound transmission equipment equivalent to those used in the industry.